The global partnership for development was conceived at the United Nations Millennium Summit in 2000 when Member States agreed ''to create an environment - at the national and global levels alike - which is conducive to development and to the elimination of poverty'' (General Assembly resolution 55/2 of 8 September 2000, Cited by  (page 9). The targets of Millennium Development Goal 8 are included under tab 3 of Development Goals (which is one part of the Reference Model). MDG 8 is considered the shorthand for the global partnership for development. 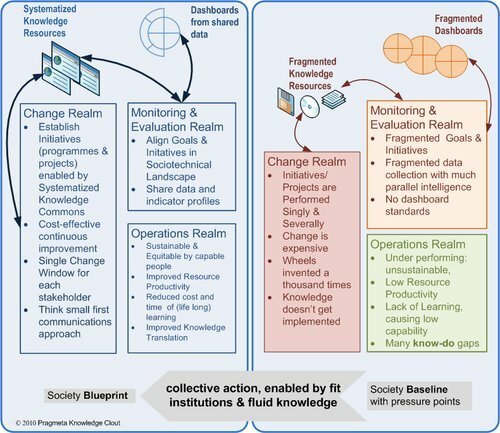 Both sides of below figure depict three types of interactions: operations, monitoring & evaluation, and change. Opportunities and economies of ccoperation depend on the type of interaction1. The left-hand side of below figure gives a high-level summary of a possible partnership's results per type of interaction. The right-hand side depicts several problems existing in current practices for each type of interaction. The initial structure and contents of the deliverable Development Drivers indicates that is desirable to take a closer look at drivers, and to document them in a systematic way. This is in order to avoid that unexpressed and unchecked assumptions make the Partnership Vision unacceptable for the silent majority. Further objectives are rephrased from those of Results Based Management handbook. All objectives are pursued in a continuous process. 1. This is explained in the linked Interaction Dictionary pages.